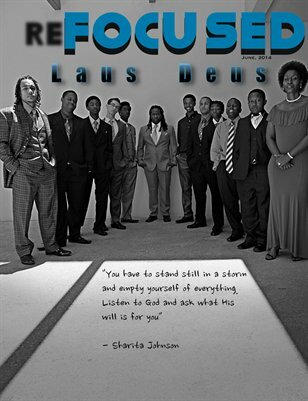 Refocused Magazine was created to inspire people to refocus themselves and discover their true purpose in life. Each story is a source of inspiration to empower the reader to regain their focus. Exclusive interview with Singer/Songwriter/Musician James Chappell III! his life. James’ soulful vocals are rooted in growing up in church and leading many of the family’s gospel songs. He’s been eager, wanting to use the gift that God gave him. During high school, James won various awards, including best male vocalist at Bloomfield High Gospel Show in 1995. James was a major influence in helping his school gospel choir receive awards in multiple talent shows. As James matured, his love for various genres of music grew. Listening to Luther Vandross, Marvin Gaye, Sam Cooke and others inspired James to begin writing and arranging his own songs and for others. 2013 proved to be a good year as James was a contestant on the TV show “The Winner Is” and won with his performance of the Bruno Mars smash “If I Was Your Man”. He’s also performed at the Willie Stargell celebrity golf tournament. James strives in furthering his musical career using his personal life experiences to encourage and inspire people to live their best life through music. That musical journey includes true love relationships, heartache, songs of faith, hope and trust in God. James is looking forward to carrying the Harris legacy into the future and hopes that his music will soon be heard around the world, lifting up the name of Jesus and touching people’s hearts! Isabel Davis shares her story! 3 fun fashion color trends this summer, how new technology is helping students and teachers, head-to-toe baby care tips for parents, and more!